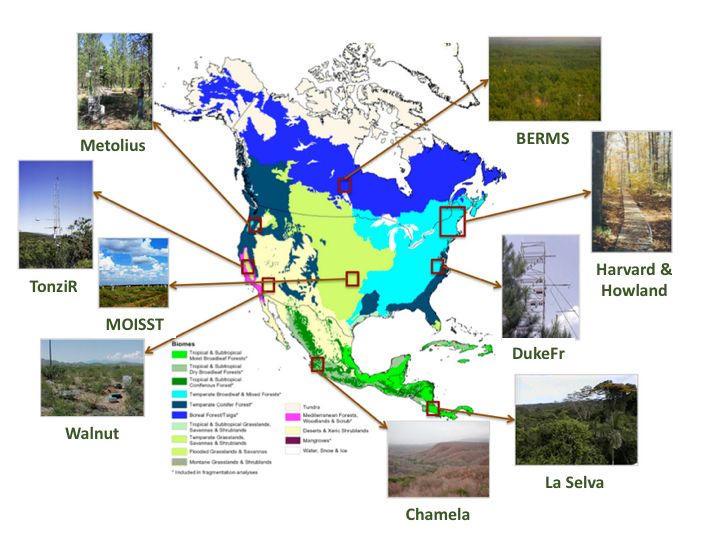 This dataset provides level 2/3 root zone soil moisture (RZSM) estimates at multiple depths at 90-m spatial resolution from the Airborne Microwave Observatory of Subcanopy and Subsurface (AirMOSS) radar instrument collected over ten sites across North America. AirMOSS produces estimates of RZSM with data from a P-band synthetic aperture radar (SAR) flown on a NASA Gulfstream-III aircraft. The resulting soil moisture estimates capture the effects of gradients of soil, topography, and vegetation heterogeneity over an area of approximately 100km x 25km at each of the study sites. AirMOSS flight campaigns took place at least biannually from 2012 to 2015 at each site. This dataset includes 204 files in netCDF v4 (*.nc4) format. Each file represents the estimated L2/3 soil moisture for one AirMOSS flight campaign for a single site on a single day. The algorithm theoretical basis document (ATBD) for this data product is included as a companion file. 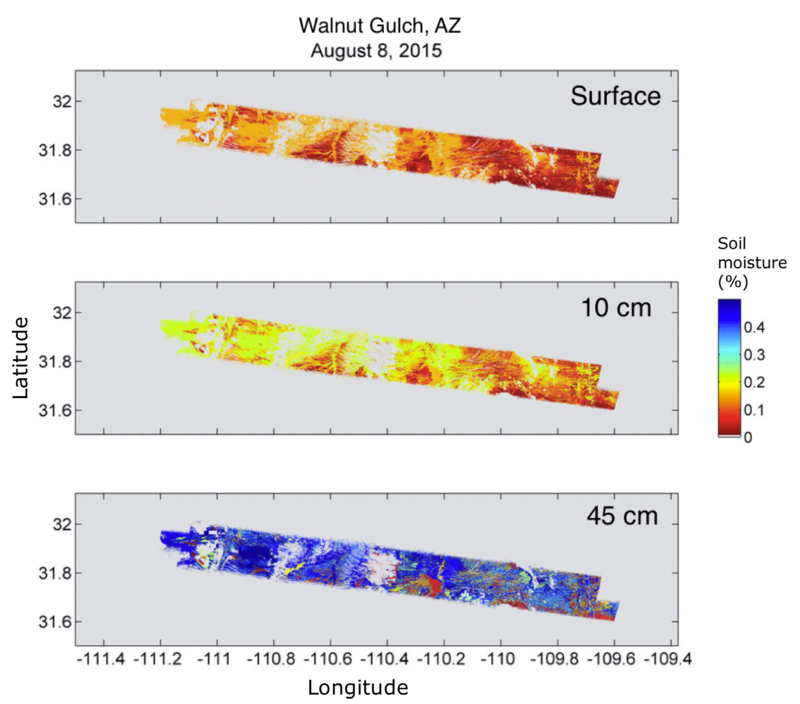 Figure 1: Soil moisture estimates at the Walnut Gulch site, Arizona, reveal a dry soil surface, but considerably more moisture at 45 cm depth. Spatial Coverage: Ten AirMOSS sites across North America (Table 1). This dataset includes 204 files in netCDF v4 (*.nc4) format. Each file represents the estimated L2/3 soil moisture for one AirMOSS flight campaign for a single site on a single day. The algorithm theoretical basis document (ATBD) for this data product is included as a companion file with this dataset as L23RZSM-ATBD-V3.2.pdf. 5-digit flight ID, where the first 2 digits are the last 2 digits of the year and the next 3 digits a numeric counter chosen to ensure uniqueness of the flight ID. 2-digit product version number starting at 01. The version number is incremented by 1 when a product is reprocessed and redelivered. Table 2. Data fields in the L2/3 RZSM data files. Volumetric soil moisture at 0 cm depth (surface). Volumetric soil moisture at 10 cm depth. Volumetric soil moisture at 30 cm depth (root zone). Value of coefficient 1 (a). The volumetric soil moisture (mv) profile information is given in terms of second-order polynomial coefficient a, b, and c where mv(z) = az2 + bz + c, where z is the depth in meters. The baseline approach for assessing the retrieval errors of the L2/3-RZSM products is to compare them against the permanent in-situ soil moisture sensor profiles installed (or otherwise available) at the AirMOSS sites (data available at http://dx.doi.org/10.3334/ORNLDAAC/1416). The error is calculated as a root mean square (RMS) measure, along with the calculation of a bias. The bias is removed for each biome on a yearly basis. The validation results showed accuracy ranging from 0.041 to 0.099 m3/m3 while confirming the intuitive notion that the accuracy decreases as depth increases (Tabatabaeenejad et al. 2015). Error in the retrieval results are associated with radar calibration errors, vegetation parameterization errors, surface roughness assumptions, and inaccuracies in the scattering and inversion models. The retrieval error generally increases when deeper points from installed probes are used in validation. This increase in error is expected as penetration depth of electromagnetic waves decreases with depth. We can therefore define a `threshold depth' for each site as the depth up to which the retrieval is mathematically valid. The threshold depth depends on the number of modeled layers and their thickness in the forward model. The validity depth for each site is different because of its different vegetation, soil texture, and soil layers. However, it can be shown that the choice of 50 cm is reasonably accurate for all sites. All 2012 and 2013 RZSM products from BERMS, Metolius, MOISST, Tonzi Ranch, and Walnut Gulch (except for Tonzi Ranch 2013) are valid up to 95 cm. All 2014 and 2015 RZSM products from BERMS, Metolius, MOISST, Tonzi Ranch, and Walnut Gulch are valid up to 45 cm. Tonzi Ranch 2013 products are valid up to 55 cm. The L2/3 RZSM product was produced using the 3 arcsec AirMOSS L1-S0 data and is reported on the same ground-projected grid. Due to the wide diversity of vegetation covers present in the AirMOSS study sites, the retrieval algorithms and the specifics of the parameter sets vary for different sites. In general, sites were categorized into monospecies (including bare surfaces and grasslands) and mixed species. As such, the BERMS, Metolius, MOISST, Tonzi Ranch, and Walnut Gulch sites were classified in the monospecies category, and the remaining sites were treated as having mixed species. Although the soil moisture retrieval algorithms that produced L2/3-RZSM data were different, the end products are similar. Inputs to the retrieval algorithm are described in Table 4 below. Table 4. Input data of AirMOSS L2/3 RZSM retrieval algorithm for monospecies vegetation. More detailed information about the retrieval algorithm can be found in the algorithm theoretical basis document for this data product, included with this dataset, L23RZSM-ATBD-V3.2.pdf. SSURGO. 2016. Soil Survey Staff, Natural Resources Conservation Service, United States Department of Agriculture. Soil Survey Geographic (SSURGO) Database. Available online at http://sdmdataaccess.nrcs.usda.gov/. Incorporates updates to 54 data files.